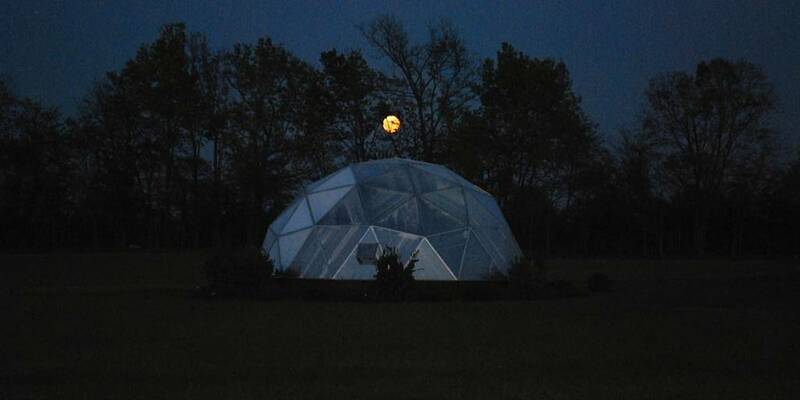 Congratulations to Denny Smith on winning the January Dome of the Month contest with his beautiful evening photo of a moon rising over his 33′ Growing Dome in Indiana! The installation of his greenhouse kit in early 2013 was a memorable one for the team as it was cold and wet! Denny was a great host, is among the favorites here with the staff, and has been a pleasure to work with. I want one. This dome is absolutely superb and well thought! A marvelous photo! I would love to see some pictures of what’s happening inside the dome. How is it working out for you this very cold winter? I hope you are having fun. Thanks for sharing. This dome is super cool! I would love if you could share with us how long did it take you to construct this and was it difficult? If it’s easy it be great to put something like this on my land. So inviting, under the full Moon! Thanks for sharing this! Hello Perry, This size takes our crew of 3 about 4 days to install. There is a day or two site prep time ahead of our crew arriving and a 4-6 days constructing and filling the raised garden beds once they leave. Feel free to call us if you have more questions… 800-753-9333.